(A) Potential duplexes formed between let-7a and candidate miRNAs. (B) A549 cells were cotransfected with lin-41 and the indicated antagomirs. Firefly luciferase reporter activity was normalized to renilla luciferase. MiR-26a and miR-376a were included as nonspecific miRNAs. Control cells in lane 1 carried pcDNA6.2-EmGFP empty vectors and were transfected with the lin-41 reporter. 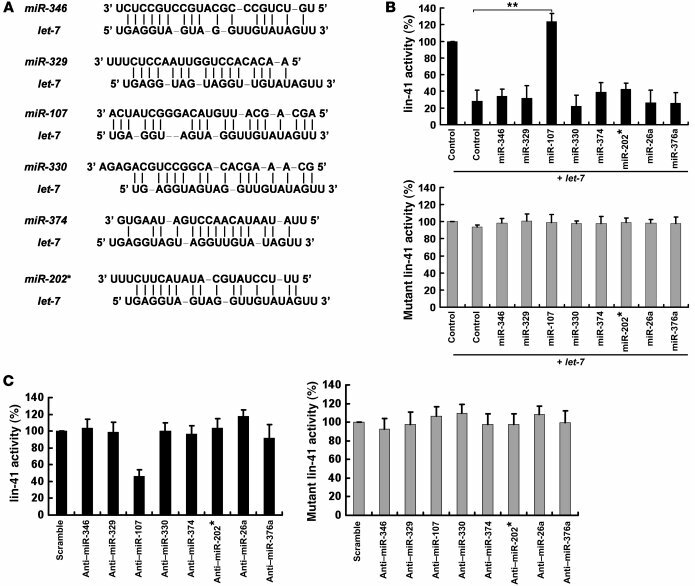 (C) Depletion of endogenous miR-107 results in enhanced let-7–suppressed lin-41 expression. MDA231 cells were cotransfected with lin-41 and the miRNA antagomirs indicated. Firefly luciferase reporter activity was normalized to renilla luciferase. MiR-26a and miR-376a were included as nonspecific miRNAs. Scramble oligo-transfected cells were used as the control group. *P < 0.05; **P < 0.01. Data are presented as mean ± SD.